During the Battle of the Bulge, the largest battle America had ever fought, Adolf Hitler chose the Sixth Panzer Army for the German juggernaut’s most important role. The decisive spearhead was given to a combat group commanded by a young lieutenant colonel named Jochen Peiper. The planning for the Ardennes offensive of 1944 was conducted with such secrecy that Peiper did not receive his formal mission briefing until two days before the assault. The offensive was Hitler’s last desperate gamble in the West. His plan was to overrun lightly defended portions of the Allied line in the Ardennes Forest and drive across the River Meuse all the way to the Belgian port of Antwerp. The capture of the major port would effectively split the Allied armies in the West in two while disrupting supply and troop movements. The Western Allies might be compelled to sue for peace. Although Peiper had over 100 tanks under his command, two pieces of disturbing news were brought to his attention. First, the route Hitler selected for him was, Peiper said, “not for tanks, but for bicycles.” Second, he would have to rely on capturing American gasoline along the way to help meet the demands of his thirsty Panzer IV, Panther, and Tiger tanks. 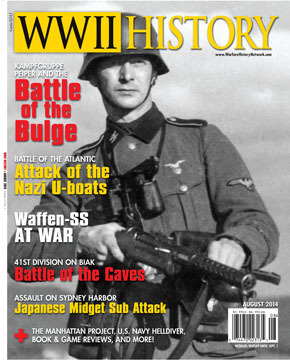 “In Peiper’s Path,” Josh Quackenbush’s riveting article in the August 2014 edition of WWII History Magazine, gives you a first-hand look at Peiper’s desperate mission. Inside, you’ll read all about Peiper’s attempt to reach the Meuse, and how American artillery played a key role in blunting the German drive. What do you think of Peiper’s mission? Do you think more planning and support by the German army was possible, and would have changed the outcome of the Battle of the Bulge? Please let us know what you think about these and other stories in the August issue in our comments section. Tags Adolf Hitler, Antwerp, Ardennes, Battle of the Bulge, Joseph Stalin, Marines, Meuse, Nazi Party, Panzer, Philippines, Tanks, The Pacific, Tiger Tank, U-Boat.